The term Enterprise addresses any non-residential in-building including hotels, convention centres, transport hubs, offices, hospitals and retail outlets. It's not just intended for businesses to serve their own office staff. This can be a more lucrative opportuntiy for small cell vendors than residential, because price points are higher. Equipment is sized larger, both RF power for wider coverage and increased processing for higher capacity. Third party systems integrators are often involved with the installation. 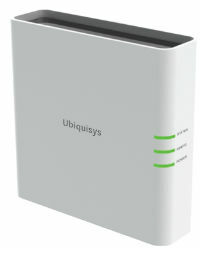 Being indoor, products don't have to be mechanically as robust or weatherproof, and are often connected by a single Ethernet cable providing both power and backhaul. Smaller businesses and home workers have not been able to justify additional cellular equipment investments up to now - the additional call traffic they generate would not qualify for additional cellsites to be installed. This traffic is aggregated up with all other traffic in their area and cellsites are planned and installed based on total capacity and coverage demands. Enterprise small cells offer the opportunity to address these enterprise markets through low cost, self installed units which capitalise on the existing broadband connections available to most businesses. This excludes those working from home for large enterprises. SOHOs and SMEs would be the initial market entry. They tend to adopt new technology more quickly, and the low cost price puts this in reach of everyone. Their product, shown on the right hand side, is typical of the format available. Larger business premises may benefit from a local controller which directly manages the cluster of enterprise femtocells, dealing with the local handoff and consolidating the signalling traffic. Spidercloud Wireless have developed a solution specifically targetted at this market, which is described in this interview with Ronny Haraldsvik, their CMO. Often businesses have a mix of different sizes of building, ranging from remote workers operating independently through to large scale office blocks housing thousands of staff. Businesses seek to offer the same range of facilities to all their staff, regardless of location and this requires a mix of different products.If additional business services are combined with the enterprise femtocell offer, such as IT services for data backup, email to mobile etc. this could provide a package with additional benefits that is cheaper to deliver and has upside of additional revenue opportunities. Some innovative network operators have specifically targetted the enterprise sector using small cells. Network Norway deployed femtocells for their enterprise customers both in the office and at their homes, capturing anything up to 80% of their mobile traffic. The remainder is handled either through their own macrocell network or via national roaming with the encumbent Telenor. This approach makes it quite cost effective to provide excellent coverage closely targetted at paying customers, while still offering good outdoor service. In principle, there is no reason why an MVNO may not also operate this way, providing it obtained the permission of its host network operator. Several MVNOs are believed to be trialling or offering this solution. Outsourcing enterprise femtocell deployment is another option for network operators. A number of organisations and consortia are proposing and/or trialling solutions, including Cloudberry Norway (interview), NEC/COLT and NEC/Virgin (NEC interview). Recent market statistics show a significant upturn of in-building digital cellular solutions. The simplicity, flexibility and ease of installation are all much better than legacy choices. Costs are further reduced when the signal source is integrated within the digital solution, allowing this approach to provide the best business case and platform for future growth. In several regions of the world, network operators seem to be so set against sharing infrastructure that they’ll actively install duplicate/parallel systems to serve their own customers. Elsewhere, a focus on cost encourages wider co-operation. What is the right answer to best improve the end customer experience? Recognising that over 80% of cellular traffic is consumed indoors, Nokia takes a slightly different approach from other vendors to address the problem. We review a white paper that discusses and expounds their views on how operators can best evolve their networks to meet the indoor challenges. Over the past year, LAA development has quietly matured with several commercial network launches around the world. Offering superfast Gigabit data rates, the technology is ready to be rolled out in-building. We review the current state of the ecosystem and share some insights from SpiderCloud who have been an early pioneer of the technology.